There isn't much to say about tonights game, the Yankees lost 5-3. Andy Pettitte started and wasn't great at all just couldn't get anything going. I wouldn't look too much into it though, as he said it is over and I am looking forward to the playoffs. The bullpen was good again making the decisions on the Yankees very tough as to who the last couple of spots on the playoff roster is going to go to. The Yankees will have Joba Chamberlain work out of the bullpen tomorrow and that is where he will be used in the ALDS it appears and then they will see what to do in the ALCS should they get that far. The Yankees still don't know who they will be playing as that could be a factor with some roster choices depending on who they play. The Twins will send Carl Pavano to the mound tomorrow with the Tigers sending Justin Verlander, if they both win or both lose there will be a one game playoff on Tuesday from the Metrodome. The Yankees have one hour after they know their opponent to choose which series they want but I am sure they are taking the extra days off so they will use 3 starters and be able to use Hughes and Mo in every game also. The most important thing about this game was the Yankees came out of it healthy and have one more meaningless game tomorrow. The regulars will play tomorrow except for Posada who will be managing as is a tradition from the Joe Torre days. It looks like this could be a trend in the playoffs also with Molina catching A.J. and Posada being the DH. The New York Giants will take on the Kansas City Chiefs in Kansas City and the New York Jets will head to New Orleans to take on the Saints. I will start with the Giants, I expect them to beat the Chiefs by a lot. I don't think there will be any looking ahead as they know what happened last year when they went into Cleveland and everyone thought they would win and they got beat up. The Chiefs have no passing attack and the Giants will be getting Kevin Dockery back to help the secondary, I expect Brandon Jacobs to get going and have a big game running. I am taking the Giants. Giants 28- Chiefs 10 The Jets I think are going to lose their first game of the season. The Saints have the best offense and although I think the Jets defense is very good they will give up some points and I don't think Mark Sanchez and the offense can keep up with the Saints. I would think the Jets keep it competitive but lose. Saints-24 Jets 17 My random pick of the week will be the Monday night game between Brett Favre and the Vikings and the Green Bay Packers. It should be interesting but Favre will be at home so it won't be like when he returns to Green Bay later in the year. I think the Vikings are good but not sure they are as good as they have looked, the Packers aren't great but should be better then they are. I will take the Vikings in a close one. Vikings 24 Packers 21 Those are my picks for week 4 of the NFL season, I was right last week with the Giants wrong about the Jets and I did get the Colts right so I am 2-1 for the season, lets see how I do. I would like to hear other opinions so please comment here and let me know if you think I am right, wrong or whatever lets have some fun with the picks as we go along. The Toronto Blue Jays fired GM J.P. Ricciardi today and the Padres did the same with their GM Kevin Towers. The Blue Jays is interesting because the players have said they want Cito Gaston out so there could be a while new power structure there and we will see if they can be back to being competitive with the Yanks and Red Sox. Kevin Towers is a longtime friend of Brian Cashman and has made several deals with him over the years, it will be interesting to see if the Yankees have any interest in bringing him in at any position not GM of course but something else. In other news the Twins are currently leading the Royals 4-1 with Detroit getting started in about an hour, if the Twins hold on and the Tigers lose, they are starting a pitcher who hasn't pitched at any level in 3 months then they will be tied with tomorrow being the last regular season game. It looks like the Yankees are getting something they wanted with the Twins winning tonight and the Tigers losing Detroit has a 1 game lead with 2 to play. If the Twins win tomorrow it will mean that no matter what Detroit does Sunday will matter and Justin Verlander is scheduled to pitch, the Yankees won't have to face him in game 1 if they played Detroit and that would be a huge advantage. The best thing would be for them to finish tied and have to play a game on Tuesday because the Vikings play at the Metrodome on Monday night. It will be interesting to watch tomorrow and see what unfolds. I would love to see the Twins tie it up tomorrow and make the last day really exciting. The New York Yankees were defeated by the Tampa Bay Rays by the score of 13-4 tonight. CC Sabathia only lasted 2 2/3 innings giving up 9 runs, 5 earned. He just didn't have his fastball command at all and was terrible. I guess the good thing is you want to get a bad one out of the way before the postseason. I am sure it was hard for him to focus on a individual goal rather then winning for the team. 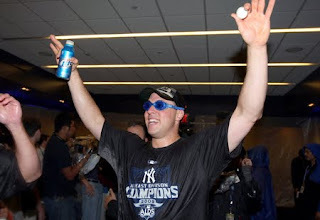 He will get to redeem himself in game 1 one Wed at Yankee Stadium. He will set the tone for the series and I would hate to be his opponent as I am sure he will be very angry and focused. The Yankees have nothing to play for and just wanted to remain healthy, they suffered a scare in the first inning when Mark Teixeira was hit in the hand and stayed down on the ground for a while. It was originally thought that it hit him in the shoulder but he said it grazed his hand and he was scared and wanted to make sure he had all his faculties before he got up. I don't know if it was on purpose or not but it could have been retaliation for Carlos Pena getting hit on the wrist and breaking it last time these two teams met at Yankee Stadium. The Yankees will send out Andy Pettitte tomorrow for his final tuneup before the playoffs. The Minnesota Twins stayed alive this afternoon with a 8-3 victory over the Detroit Tigers. The Twins are 2 games out with 3 to go so it is still a long shot but they have a shot anyway. The Twins head home to take on Kansas City and the Tigers will take on the White Sox at home. There was an interesting twist to the game today, in the ninth inning Delmon Young got hit by a pitch and apparantly was unhappy with his own teammate who caused this all by hitting a Tiger earlier in the game. Delmon Young got up off the ground and pointed at his own dugout and manager Ron Gardenhire said that the pitcher did the wrong thing also. The Yankees hope this goes down to the final day so the pitching rotations will be all messed up and the best scenario is if they tie and have to play a game on Tuesday to see who will play the Yankees starting on Wednesday. Tomorrow- CC Sabathia vs David Price Saturday-Andy Pettitte vs Jeff Niemann Sunday- A.J. Burnett vs Wade Davis This is the last series of the regular season and doesn't mean anything. The pitchers will only pitch 5 or 6 innings as a tuneup. The regulars may play tomorrow to try and get CC his 20th win but he won't be in there much longer then 5 innings. They just don't want to get hurt head back home and get ready for Wednesday's Game 1 of the ALDS. Yanks lose finale to K.C. The New York Yankees lost to the Kansas City Royals by the score of 4-3 tonight. They capped off a wonderful inaugaural season at the new Yankee Stadium with a 58-23 record. The Yankees of course are only temporarily done with their home ballpark as they will be back there after a weekend getaway to Tampa to close out the regular season. The story of this game was Joba Chamberlain not able to back up his good performance against the Red Sox last week. He was not very good at all today last only into the fourth inning giving up 3 runs on 7 hits with a few walks. The bullpen only gave up 1 run the rest of the way. Damaso Marte, Sergio Mitre, Phil Hughes, Mariano Rivera all pitched. 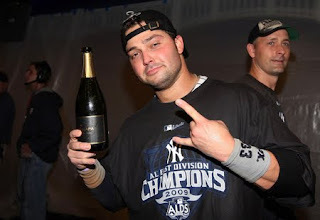 Derek Jeter had 2 hits, Nick Swisher had a 2 run homerun and that was about all for the Yankees offense. They tried to stage a late rally getting 2nd and third in the ninth inning but Ramiro Pena flied out to center to end the game. The Yankees will try and get CC Sabathia his 20th win on friday and then Andy Pettitte and A.J. Burnett will also pitch just getting in tuneups before the postseason. It does look like the Yankees will be taking on Detroit, the Twins have to win tomorrow otherwise the Tigers will clinch the division. The New York Yankees defeated the Kansas City Royals tonight by the score of 4-3. They continued their magical season with their 15th walkoff win and 50th come from behind victory of the year. A.J. Burnett got the start and looked great pitching 6 1/3 innings allowing 2 runs, 1 earned on 3 hits with 3 walks and 8 strikeouts. Phil Coke came in to pitch and pitched a inning and 2/3 he gave up a couple of runs but basically because of his fielding as he took his time on a bunt and let Gordon beat it out then threw a ball hit back to him into center field and then on another comebacker to him didn't throw home when the runner was clearly dead in the water. Dave Robertson pitched 2/3 of an inning not allowing a hit or run. Brian Bruney finished it off with 1 1/3 scoreless innings as he trys to work himself onto the postseason roster. Juan Miranda had the walkoff hit which is great to see out of another young guy. Francisco Cervelli had a hit, A-rod had a hit and a walk. Derek Jeter had a hit and a walk, Mark Teixeira had a solo homerun giving him 39 homeruns and 121 rbi's. Nick Swisher had a solo homerun and Jose Molina had a hit. The ninth inning started with a single by Francisco Cervelli, Eric Hinske had a pinch hit single putting Cervelli on third. Robinson Cano got ahead 3-0 and got the green light and promptly crushed a ball to deep center, it was caught but was a sac fly. Eric Hinske then stole second and went to third when the ball was thrown into center. Johnny Damon was walked intentionally and Juan Miranda hit a single off of Kyle Farnsworths leg. The Yankees will go for the sweep in the final regular season home game of the year. Joba Chamberlain will try and end his season on a good note and continue the success he had from his last start against Boston. The New York Yankees defeated the Kansas City Royals from a rain soaked Yankee Stadium by the score of 8-2. The game was delayed nearly 2 hours and then only took about 2 1/2 to complete. Chad Gaudin got the start and was good, the Yankees are 7-0 in his starts so he has really given them something to think about for the postseason and for next year. Alfredo Aceves finished off the game. Gaudin gave up 2 runs in 6 2/3 innings. Aceves finished off the last 2 1/3 innings. The lineup had Ramiro Pena, Francisco Cervelli, Shelly Duncan and Juan Miranda in it. Shelly Duncan had a rbi single, Francisco Cervelli had a couple of hits but the biggest one of all was Ramiro Pena hitting his first career homerun. The guys in the dugout gave him the silent treatment before jumping all over him, it was a great scene and you could tell how much they really like this kid. The Yankees have had a great year and a lot of the veterans have come up huge but a lot of the young kids have also stepped in and done a great job. Ramiro Pena and Francisco Cervelli have so impressed the Yankees they probably have spots on the 25 man roster next season. It is really great to see when you have a mix of young and old and the team just keeps rolling along. Robinson Cano had a grand slam which is good for him because if he hits in the cluth in the playoffs that will be huge for this team. He and Melky Cabrera will be off today and you will see the rest of the guys back in there. A.J. Burnett makes his final start of the regular season hoping to keep his recent success going and carry a good frame of mind into the postseason. The New York Giants won big today over the Tampa Bay Bucs 24-0. Eli Manning was good and the Giants finally got their running game going with Brandon Jacobs getting 92 yards and Ahmad Bradshaw had 104. Steve Smith was the leading reciever once again with 7 catches for 63 yards. Mario Manningham had 4 catches for 55 yards and Kevin Boss had a couple of catches for 27 yards. Sinorice Moss had a catch for 18 yards and a touchdown and Travis Beckum the rookie tight end had a couple of catches for 8 yards. The Giants defense was dominant as they held Tampa Bay to 86 yards of total offense. The thought coming into this game was yes Tampa is not a very good team but that they could score points and the Giants just totally shut them down. The Giants will head to Kansas City to play the chiefs next week another team they should beat before returning home to play the Raiders. The New York Jets defeated the Tenesee Titans by the score of 24-17 today at the Meadowlands. The Jets have been very impressive going 3-0. Mark Sanchez continues to impress as well as their defense. Sanchez was 17 of 30 for 171 yards, 2 touchdowns and a interception. The Jets did not run the ball well at all as Leon Washington had 46 yards and Thomas Jones had 20. Cotchery was the leading reciever with 8 catches for 108 yards. I picked the Giants to win and the Jets to lose so I am 1-1 on the year with my picks and I am also going to win the Indianapolis game so I will be 2-1 in my first week of picks. These pictures say it all, there are a lot more out there on the web but I thought I would just post a couple. The New York Yankees are the AL East division Champs and have homefield advantage throughout the playoffs. I think it was fitting that Andy Pettitte got the win and Mariano closed it out for him like they have done so many times before. Derek Jeter got a couple of more hits. The scene was great as they had a nice celebration but kept mentioning to Kim Jones on YES that they aren't finished and this is the first of their goals. I really feel confident with this team going into the playoffs with CC Sabathia being the ace of this staff and Pettitte and A.J. Burnett falling behind him and a good bullpen with a deep lineup. This team should beat Detroit or Minnesota because they are just better then them. The ALCS will be fun if they make it there because they will play one of their two rivals in the Angels or Red Sox. The Yankees will take this last week to rest some guys and get Dave Robertson into 2 or 3 games and make sure he is ready to go for the postseason. Joba will make his last start on Wednesday and that will be important also as they want to see him pitch well again before putting him in the bullpen for the first round and him being the 4th starter after that. The Yankees will enjoy this now but in another week get back to work and focus on winning 11 more as they strive for Title 27.